The Brazilian Grand Prix was supposed to be a classic, to send the 2013 season off in the style it has lost since the summer break. It was a good race, although perhaps not the chaotic rain-filled session we thought it might be. Emotions ran high as Felipe Massa bid farewell to the team he's spent many seasons with, and Mark Webber said goodbye to the sport as a whole. 71 laps unfolded, with spots of rain here and there, a handful of penalties, and some great overtaking battles throughout. If you missed any of the action or want a recap of specific parts of the race, then this lap by lap coverage may be just what you're looking for. Sebastian Vettel wins the race, with Webber second and Alonso third. 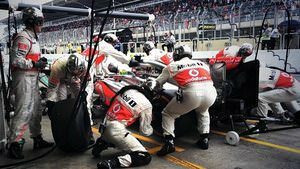 McLaren get a strong double points finish to boost their spirits. Grosjean retires on lap four with a very smokey engine blowout. Massa lashes out at the FIA after a drive through penalty for cutting the pit entry. Lewis Hamilton given a drive through penalty for collision with Bottas, ending the Williams' race. Hello FBFB friends, we're reached the final race of the 2013 season! High fives and/or commiserations! It's Brazil, it's likely to have mixed conditions, and there's nothing but pride at stake. Hopefully we can send the season off in style. The pit lane has just opened at Interlagos, engines are roaring and the drivers are making their way to the grid. We've got Sebastian Vettel on pole position, as you might expect. He's looking for his ninth race win in a row, and his 13th overall - to match a record by Schumacher of most wins in a season. The Ferrari mechanics form a line to applaud Felipe Massa, as he exits the garage on his final race for the Scuderia. Bless them. Tweet from @MercedesAMGF1: Trying to get in a weekend's worth of practice starts during the 15 mins before pit lane closes! It has been raining and wet throughout all three practice sessions and qualifying. Q3 was actually delayed by about 40 minutes due to the conditions. Sergio Pérez managed to crash his car in Q2, but still qualified 14th ahead of teammate Jenson Button. Unfortunately, the Mexican had to take a five place penalty due to changing the gearbox, putting him down in 19th. The hard and medium compounds are on offer this weekend, although we have seen barely any of them so far - what with all the intermediate action. Looks like it should be a dry start to the race, though, so hard tyres (orange) and medium tyres (white) will be the choice. Interview with Sebastian Vettel: "It's a bit different because it's dry at the moment and we haven't had any practice in dry sessions. It's difficult to get everything right, it's the same for everyone though." Tweet from @radarguruf1: #F1 radar update 13:45 BRST: Shower development now beginning across southern Sao Paulo. Not definitive, but rain looking likely mid-race. Interview with Felipe Massa: "Very emotional, very special day. I hope we can have a great race, it's definitely an emotional day for me, for the team, for my fans, for everybody." Mark Webber's crew, surrounding his car, have all donned bush hats. No corks in sight, but a tribute to the outgoing Australian. Paul di Resta's car waits for him, via @clubforce. 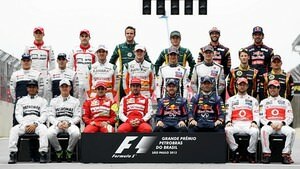 Red Bull were the only team that sent their drivers out on each compound, to decide which was the best to start on. Others were presumably confident with their first choice. The formation lap begins, with Vettel lead the pack away down the start straight. Only Jenson Button and Esteban Gutiérrez are starting on the harder compound, everyone else on the white sidewalled medium tyres. The mechanics are jogging back to the pit lane, aww, that's the race I'll miss in the off-season. Run, run, run! The top runners round the final corner and line up on their grid stops, waiting for the rest of the field to filter into position. Vettel had a terrible start, with Rosberg getting ahead into the first corner! Hamilton and Alonso also closed up on the Red Bull but settled in behind. Alonso is now trying to move past Hamilton for third. It was a really clean start, unusual for Brazil, no incidents throughout the field. Vettel lines up Rosberg round the final corner, pulls alongside down the home straight and passes him for the second lap. Alonso also passed Hamilton at the same time, but it was slightly less easy for the Ferrari. Hamilton drops back another position as Mark Webber puts his foot down and barrels through. Kovalainen has had a terrible start, dropping all the way down to 15th place, sitting behind Adrian Sutil. Alonso has turned his attention to the other Mercedes driver, closing up to within half of a second of Rosberg. Tyre smoke is pouring out the back of Romain Grosjean's car as he pulls off track. Brief yellow flags and the DRS is disabled. None of that stops Alonso, though, who sweeps past Rosberg for second place. Mark Webber also closes in. 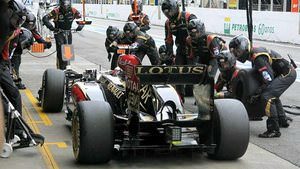 Lotus had been hoping to charge Ferrari for position in the championship, but with Grosjean out and Kovalainen way down and out of the points, it's an impossible task. Vettel is pulling away at the front, as per usual. Alonso is holding station in second, with Webber desperate to get past Rosberg for third. The Red Bull driver sweeps round the outside of the first corner to take third from the Mercedes. A disappointed Grosjean is sprinting the entire length of the pit lane to get back to the Lotus garage, helmet in hand. Hamilton locks up massively as he closed up to his teammate Rosberg into the first corner. 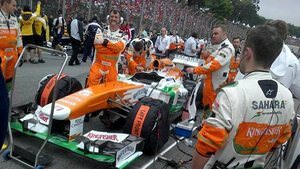 Replays show us Adrian Sutil losing two places in one corner, as both Esteban Gutiérrez and Sergio Pérez sweep past the Force India. Turn 12 incident on lap 1 involving Sergio Pérez and Paul di Resta under investigation - forcing another driver off track. The biggest 'losers' at the start of the race were Jean-Éric Vergne, who's dropped down seven, and Kovalainen who lost six places. The winners were Button who's up six places to 8th, and Pérez who is up to 11th (but under investigation). Tweet from @tonyfernandes: Well done boys past the marussia and keeping pace with midfield. Lewis Hamilton dives to the inside of Nico Rosberg and takes fourth place from his teammate. Jean-Éric Vergne comes in to the pit lane for his first stop, that's dropped him all the way down to last place. There's no further action on the Pérez and Di Resta incident. Scratch that, Webber sweeps past and up into second place. Brilliantly clean racing between two friends. Red Bull 1-2 now. Nico Hülkenberg was busy defending from Jenson Button, but had nothing coming out of the corner to stop the McLaren. Button moves up to 7th place, as Pérez gets himself up to tenth. Daniel Ricciardo comes in for his pit stop - the two Toro Rosso drivers have come in very early this race. Felipe Massa gets past Rosberg for fifth place. The Mercedes pair are struggling to defend this afternoon. Team radio to Fernando Alonso: "No rain expected in the next twenty minutes." The official radar says no rain in the next thirty minutes. Di Resta informed over the radio that now is the time to push. He's chasing down Pérez. Super slo-mo replays of Sebastian Vettel show him locking up his front tyres, whilst there's some bits coming off the rear rubber as well. It's hard on the tyres out there. Out front, Felipe Massa and Sergio Pérez come in to the pit lane. Team radio to Sebastian Vettel: "Okay Sebastian, there are just a few spots of rain in the air. Nothing too serious at the moment, so we stick to the plan." Quick stop for Kovalainen, the sole remaining @lotus_f1team runner. Button, Hülkenberg and Di Resta all come in to the pit lane. Busy few laps for the mechanics now. Fernando Alonso and Lewis Hamilton pit from fourth and fifth place. Vettel, Webber and Rosberg lead the pack having not yet stopped. Alonso is the first driver to have stopped, with Felipe Massa behind him. Jenson Button passes Esteban Gutiérrez, and then the Sauber driver comes in for his stop. I think both the Mercedes drivers have lost out in the pit stops, with Rosberg coming out behind Button, and Hamilton behind Massa. All four having stopped, and in genuine position. Mark Webber comes in from second place, and it's a massively slow stop for Webber. Well, massive relatively speaking. Webber's heart must have sunk as he saw Fernando Alonso sweep past as he emerged from the pit lane. The hard work has to be done all over again! Vettel pits from the lead, and it's a better stop for the German. He rejoins in first place, with Webber closing up to Alonso to try and get back near his teammate again. Webber sets the fastest lap of the race, as he crosses the line and swoops past Alonso. The second DRS zone brought the Ferrari back into contention but he didn't have the pace to get back past. They remain close through the next few corners, but Webber has the advantage now. On the next lap, the first DRS zone allows Alonso to close up, but he still isn't close enough into the second to make any dent on the gap. It's worth noting that Alonso is on the harder compound to Webber, whereas Mark still needs to use the hard tyre later. Rob Smedley gets on the radio to Massa, informing him that he thinks Hamilton has a problem with his KERS, and it sounds like Massa may also have an issue. Incident involving Felipe Massa under investigation - crossing the white line at pit entry. Replays show Bottas and Gutiérrez touching wheels as they head into the first corner side by side. The Sauber gets ahead. Team radio to Felipe Massa: "We have a message again, please watch the pit entry, don't cross the pit entry with all four wheels." Tweet from @radarguruf1: #F1 radar update lap 30: Showers continuing to build just a few miles north of the circuit. A few drops at the moment. Pastor Maldonado has also reported some drops of rain in the first sector. Drive through penalty for Felipe Massa - crossing the white line at pit entry. Hamilton was wrecking his tyres trying to get past the Ferrari of Felipe Massa, but he backs off knowing the driver has a drive through to take. Having said that, Felipe Massa doesn't come in this time, he has a few laps with which to take the penalty, so this is holding Hamilton up a lot. Felipe's reaction to the drive-through: "This is unbelievable, UNBELIEVABLE FIA. UNACCEPTABLE." Felipe Massa finally comes into the pit lane, releasing Lewis Hamilton - who was just getting frustrated on the radio about the slowing Ferrari. Massa rejoins in eight place, behind Sergio Pérez. Jenson Button is getting on the "engineer-bashing" bandwagon. "Stop talking to me in braking zones," he says. Tricky when the whole track is one big braking zone, but message received! McLaren will likely forgive Button any stress this afternoon, he's currently running up in fifth place - an incredible position for them this season. Adrian Sutil dives into the pit lane for his second stop of the day, releasing his own teammate to move up to 11th place. Some of the cameras around the track have rain spots on them. Exciting! Team radio to Mark Webber: "You must stay away from the white line at pit lane entry. We will get no more warnings." Sutil informed he is the fastest driver on the circuit - he posts a 1:17.4 as Vettel, who you'd normally give that title to, sets a 1:17.7. On a charge, Adrian Sutil closed right up behind a Williams to make the pass and move into 14th. Button pits, with Massa coming in as well. 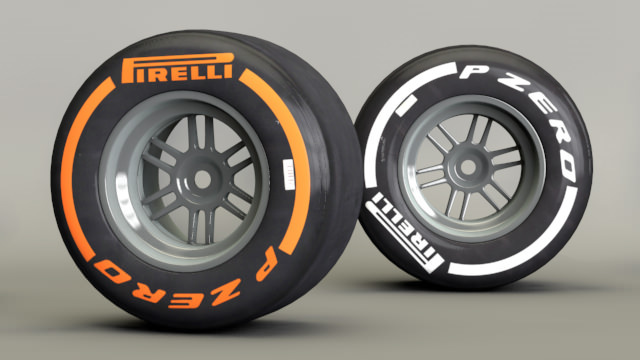 It's mediums for the McLaren and hard tyres for the Ferrari. Replays show Sutil unlapping himself, with the Force India sweeping past Sebastian Vettel on the home straight. Nico Rosberg and Sergio Perez come in for their stops, and the order between them remains as they rejoin. The other Force India, Paul di Resta, is struggling now, with Felipe Massa closing up behind him. The Ferrari sweeps through to move up to ninth. Yellow flags as Valtteri Bottas spins off at turn four and out of the race. Lewis Hamilton has a massive wobble and his right rear tyre gives up. Vettel comes in to the pit lane and it's a massively long stop for the race leader. Webber comes in behind and has to queue for a moment. Lewis Hamilton managed to get back to the pit lane, whilst we're waiting to see a replay of Bottas's accident which may also have been a tyre failure. Super quick stop from Mercedes to get Hamilton back out on track again. The replays show it was contact between Hamilton and Bottas that shredded both their tyres and caused the issues. Bottas was behind, and closing quickly, with Lewis Hamilton moving across a little bit. Contact occurred, but where the blame lies, I wouldn't like to say. Replays show one Susie Wolff watching on in the pit lane and mouthing a choice word or two as she sees the accident on the screens. Incident involving Lewis Hamilton and Valtteri Bottas under investigation - causing a collision. The slow stop has allowed Webber to get back within five seconds of race leader Vettel. But, his biggest problem is Fernando Alonso is just half a second behind and hoping for second place! It's Alonso and Webber, yet again, those two fighting for position throughout this race, and their racing is just beautiful to watch. If there's anything I'll miss next year with Webber gone, it's that. Replays of Vettel's stop show the front right tyre was slow going on, they went and got another tyre from the garage. Drive through penalty for Lewis Hamilton - causing a collision. It looks like Red Bull were reacting to the tyre failures on the other cars out on track, a bit of panic, and they only had three tyres ready. Team radio from Mercedes. Lewis: "It's not my fault." "Yes mate, we don't quite understand it, but we have to take it. Just keep pushing as hard as you can." Hamilton takes his drive through penalty straight away, the team worried about the changing conditions. Drive through penalty for Giedo van der Garde - ignoring blue flags. Oof, the stewards are busy today! Adrian Sutil comes in for a pit stop, as out on track Sergio Pérez tries to move past Nico Rosberg - the McLaren driver looking for fifth place. The wide shots of the track show a lot of moisture hanging over the circuit, the rain must be incoming very soon. Official radar says the rain will start in three minutes and last for fifteen - it's described as "steady." Tweet from @GPGuide: Maybe the Stewards should treat all GPs as the LAST ... since they apparently are now capable of making quick decisions ! Looking inept ! Lewis Hamilton is busy fighting his way back up the order, cleanly passing Daniel Ricciardo, who in fairness didn't make it that difficult for him. A nice shot of Sergio Pérez's stop from a while back, via @McLarenF1. There's a lot of movement on the pit wall, with eyes on the skies. Christian Horner has been up and off his seat, whilst there are a lot of hands sticking out from the Williams wall, trying to feel the moisture in the air. Interview with Valtteri Bottas: "I need to see the video, the only thing I know is it wasn't my fault. I was on my line, I think I was going straight. There was no point to have a shunt there, difficult to say. I think it could have been difficult [to get into the points] but it's still raining a little bit and anything could happen." Jean-Éric Vergne is diving this way and that to try and get past Pastor Maldonado, he pulls alongside the Williams but Maldonado stays ahead for now. Pic's car has stopped on a hill, and the marshals are desperately trying to clear it but not making much progress pushing it up the hill. Adrian Sutil easily moves past Kovalainen for 13th place, he's on fresher tyres yet again. Pastor Maldonado spins on track, he twirls the car around to face the right way, with Button pulling alongside and having to be careful as he went through. Replays show Vergne moves to the inside of the Williams into the corner, with Maldonado shutting the door on the Toro Rosso. Contact was inevitable and Pastor ended up facing the wrong way. Incident involving Jean-Éric Vergne and Pastor Maldonado will be investigated after the race - causing a collision. Just five laps to go now. Vettel continues to lead, with Webber behind and Fernando Alonso in the final podium position. Jenson Button is still doing incredibly well in fourth place, with Sergio Pérez just two places back in sixth. Max Chilton has come into the pits with just a couple of laps to go, fresh tyres on the Marussia and he heads out again. Vettel rounds the final corner to start his final lap. 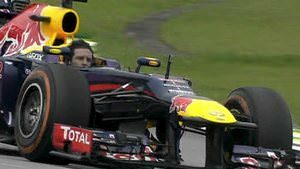 Team radio to Mark Webber from Christian Horner: "Last lap, Mark, enjoy it." Sebastian Vettel wins the Brazilian Grand Prix! Nine consecutive wins, and 13 wins in one season. Crazy! Mark Webber crosses the line second, with Fernando Alonso third. Max Chilton crosses the line to finish the final race of 2013 - he has seen the chequered flag at every race this year, reportedly the first time any rookie has achieved that. Jenson Button scoops fourth place, the best McLaren finish of the year. Mark Webber has taken his helmet and his fireproof balaclava off. He might be feeling the freedom, but that's madness. Mark Webber without a helmet. Awful behaviour! More donuts from Vettel as he celebrates yet another F1 record broken. Felipe Massa climbs from his car and gets big hugs from the Ferrari team and his family across the barrier. Caterham failed to reach their target of 13th place, meaning Marussia finish tenth in the championship for the first time! That was the last race featuring V8 engines in Formula One, with all the regulation changes next year. Grosjean will probably be glad to see the back of them! Vettel takes to the podium for the final time this year, and the national anthem plays out to the waiting crowds. Huge cheer for Webber accepting his second place trophy. Alonso kisses the third place trophy and then it's time for champagne. Webber slips over messing about with the champagne. Fun times up there. The podium interviews begin, with Sebastian Vettel insisting the interview starts with Mark Webber. 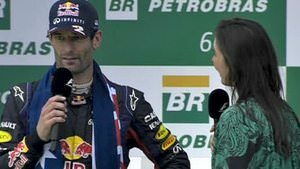 Podium quotes - Mark Webber: "It was a very good finish to my career. A good fight with all the guys I've enjoyed fighting with for most of my career. Seb, Fernando, Lewis, Nico, all the guys who have been in the window for the last five or six years. I want to thank the team, enjoyed the last few laps. It was a very nice way for me to finish. "I want to thank everyone in Australia. I wouldn't be here where I am without the support I had in the early days. It's been a thoroughly enjoyable career, a great journey, one which I'm proud of. There's been so many people who played a special role in my career. They know who they are. Thank you very much if you're watching. Enjoy watching Formula One next year with these guys, but off to Porsche, looking forward to it. Thank you very much." Podium quotes - Sebastian Vettel: "I'm actually quite sad this season has come to an end. The last couple of races, really since the summer break, to win every race is unbelievable. The car has been phenomenal, just kept getting better. Today was an interesting race, I had a poor start, but was able to come back in the first lap, build a gap. Nice to control them but then in the pit stop, I was waiting for my tyres again, I think it was a bit of confusion going on as we had both cars coming in the same time... With the last laps, very difficult with the rain... extremely proud, big, big thank you to the team. Thanks to Renault." Podium quotes - Fernando Alonso: "It was a difficult race for everyone, unfortunately the rain didn't come. I think we were more competitive in wet conditions. It seemed it was going to rain in any moment but then it didn't, so it was a shame for us, but at least we are on the podium. We finish the season on a high and then hopefully next year we start with a completely new direction, a positive trend and looking forward." This race signals the end of Cosworth in F1 again. They're not back next year, not making V6s, so F1 waves a fond farewell to the iconic brand. So, with nineteen races complete, a long old F1 season comes to an end. But guess what? It's not all that long till the next one! As the top of the Sidepodcast site says "Next race: Australian Grand Prix, Melbourne in 111 days, 11 hours and 55 minutes"
Hope you'll stick with us during the off-season and the build up to 2014, it's bound to be a lot of fun seeing how everything evolves for next year's shake-up. Thank you for reading the Factbyte Factbox this year, hopefully it has been of some use! See you in 111 days, fact fans!